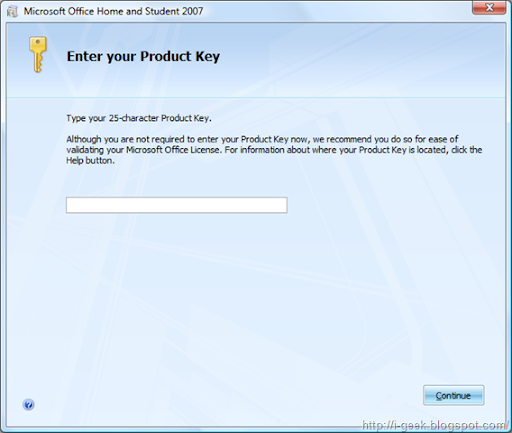 geeklog- ultimate geek knowledge: How to activate Microsoft Office Suite 2007/08? 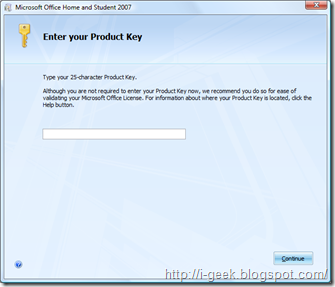 This is a quick guide on activating or checking the activation status of Microsoft Office Suite 2007/08. To continue to use all of the features of your product, you must activate the product. Microsoft Product Activation is a Microsoft anti-piracy technology designed to verify that software products are legitimately licensed. Activation works by verifying that the Product Key, which you must supply to install the product, is not in use on more personal computers than are permitted by the software license. Microsoft Office Activation might say "The 2007 Microsoft Office release is preinstalled in your personal computer. You can try it free for 60 days, activate it with a purchased product key or buy it anytime." if you haven't already activated the Microsoft Program. To try Microsoft Office free for 60 days, go to the Try Microsoft Office tab. Connect to the Internet and click Step 1 to request a trial activation key online. 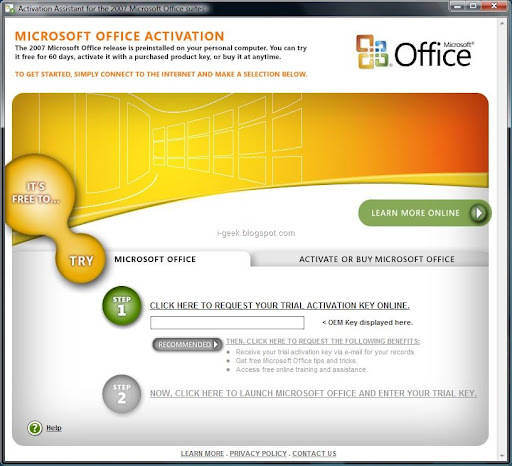 Click Step 2 to launch Microsoft Office and enter the trial activation key. Then follow the additional steps to complete the activation process. Note that Step 1 must be completed to access Step 2. We recommend that you select the additional benefits to request an e-mail with the trial activation key for your records. To activate the software with a purchased license, go to the Activate or Buy Microsoft Office tab. Locate the product key on your purchased software or confirmation e-mail. Click activate a purchased license and enter the full product activation key. Then follow the additional steps to complete the activation process. Note that the language and suite of the purchased license should match the preinstalled software. To buy the software(Microsoft Office Home and Student 2007), you are encouraged to revisit the location of your PC purchase or go online to the Microsoft product purchase site @ http://digitallocker.windowsmarketplacelabs.com/. Additional information is available online regarding the preinstalled software on your PC. Enter your Microsoft Office Passport logon name or create an account online.